The Hebrew-language Communist Party of Israel website reported that Hadash and Young Communist League of Israel (Banki-Shabiba) activists spent nights distributing these flyers throughout the city. The message simply quotes from the Hadash-Ta’al electoral platform: that “a fifth of Israel’s population is Arab” and, something that should be taken for granted: they are legitimate and equal citizens. The Hadash-Ta’al campaign argues that the Jewish Israelis’ Arab neighbors are facing a concerted attack from the racist Nation-State Law Government which seeks to incite against one fifth of the population and de-legitimize them politically. 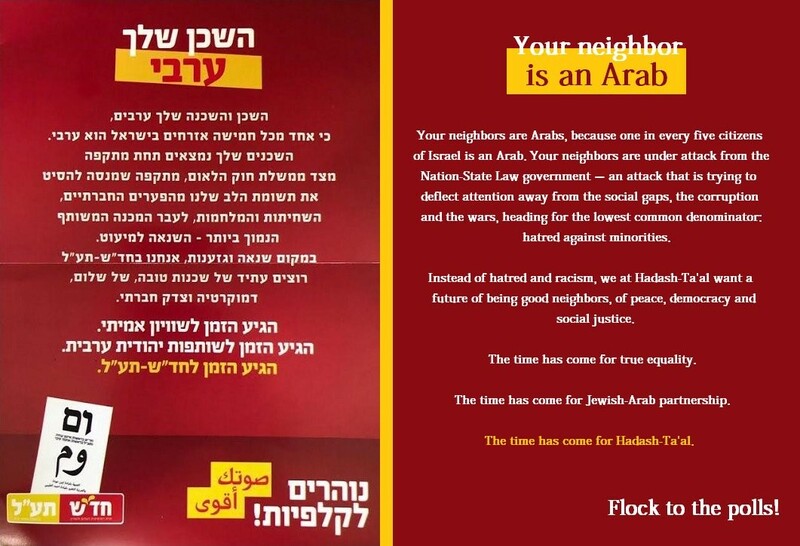 Instead, the recipients of the flyer are urged to respond to the Right’s unrestrained campaign of hate and fear by choosing a true alternative, one that promotes equality, peace, and democracy, and to flock to the polls and cast their ballots for true equality, a Jewish-Arab partnership, by voting Hadash-Ta’al.